At the outset of the first episode of Phantom India, Malle’s issue concerning what is true about India is explicitly addressed. He reminds us, v isually, that much of our understanding of India comes from the 2% of the population that is English-speaking . But these interpreters are employing Western-learned categories and constructions and consequently seeing India through a reductive Western cultural lens. Their testimony, Indian though it is, is suspect. Malle states that it is his intention to explore India, as much as possible, without preconceived prejudices. He has no planned itinerary and will go and photograph wherever the opportunities lead him. The narrative structure of this first episode is organized around roughly six issues or themes that occupied Malle’s mind during the early stages of his journey. 1. The Intrusion of the Camera. 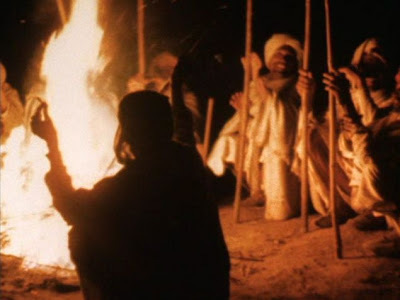 Malle knows from the beginning that the camera interferes with the natural life and rhythms of the people. It is an artificial intruder. And he knows, too, that his own Western perspective cannot be erased. He must necessarily view what he sees from his own cultural context – and that will inevitably diminish certain aspects of what is there. So all he can do is try to operate as best he can under these conditions. He first encounters peasant women gleaning fodder in a dry and nearly barren field. The women fear Malle’s camera and turn their backs on the filmmakers, believing that the camera will cast an evil spell and somehow rob them of their spirits. Malle is acutely aware of his having barged into their world without permission. With such a cultural breach, there is no possibility of engagement. Later he films a band of travelling shepherds, a ritual-dominated village wedding, and other sights that catch his eye. In each case he concedes that he is filming them only because they are bizarre and uncomprehended sights from his own perspective. A fundamental feature of Indian society, its caste system, is, of course, a matter of considerable fascination to Malle. He photographs members of the Brahman caste, who, though often impoverished, are privileged and treated with utmost respect. He points out that there are more than 1,800 subdivisions within the general Brahman caste and that there are restrictions on these groups inter-marrying or even sharing a meal. This sequence begins, in a brief homage to Alfred Hitchcock's The Birds (1963), with buzzards flying in from the sky to land and gather in an open field. Malle and his companions have stopped to film a dead buffalo there that is being scavenged by the buzzards and by wild dogs. Despite often severe food shortages, it is forbidden to slay or slaughter cattle in India, so the cattle are left to be eaten by the scavengers. This scene provides a visual lesson in the distance separating us from the traditional Indians. We watch the disturbing scene of the dead animal being eaten up, its organs pulled out of its body, its eyes devoured by the hungry buzzards. At the same time the nearby Indian peasants in the neighbourhood are un mindful of the eerie slaughter. To them it is probably all a part of the great cycle of endless birth and death that is acknowledged as a basic and daily part of their universe. 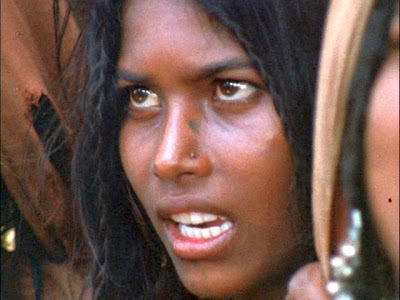 Throughout the episode, and the series, too, the women of India attracted Malle’s attention and fascination, and indeed, I am personally aware that Malle had at least one romantic affair with an Indian woman during this period. Indian women are colorful, graceful, and very often beautiful and alluring, but they are conventionally kept as a separate pole in a bipolar society. Unlike women in Muslim countries, whose public presence is erased and whose human rights are usually severely restricted, Indian women are emphatically present in the public space and frequently bejewelled in relative splendour. But they are confined by social strictures. Although dancing is popular in India, Malle rarely saw women and men dancing together. So it is with other things; the women and men occupy separate spheres. When Malle observed and photographed weddings, he could see expressions of reverence, pride, and respect, but he never saw expressions of true love. And though the groom often looked happy, the bride never did. The one fleeting moment he captured of a boy and girl caught in a flirtatious moment was the exception that proved the rule. Malle and his crew encounter two youthful French hippies who have been attracted to the alternative lifestyle that India seems to offer them when compared to that of Europe. The fiercely idealistic duo distinguish themselves from the self-absorbed youth who come to India merely seeking ephemeral gratification from hashish. They are romantically seeking a nonmaterialistic way of life, and they celebrate the way they perceive Indians live a seemingly egoless existence. They plan to live their lives there. But when Malle encounters the two again a few months later, things have changed. One of them has been now exhausted by intestinal illnesses and is borrowing money from his parents to return home. The other also seems now to be less idealistic, as well, and has set a travel itinerary for himself. It is evident here, too, that these young French visitors had been looking at India through the prism of their own fantasies. The final section of this episode presents a little drama that Malle and his crew happened onto by chance. A collection of untouchable peasants, both men an d women who catch fish along the beaches with only handmade nets, are approached by a higher-caste and better-dressed young man who seeks to buy their fish and sell it at the market. This is the only way these powerless, casteless people can earn money, and there is a lengthy scene in which they engage in a heated, vituperative argument with the fishmonger over the selling price. The haggling over pennies is something that goes on constantly in India, a society where the inequality of wealth is enormous. 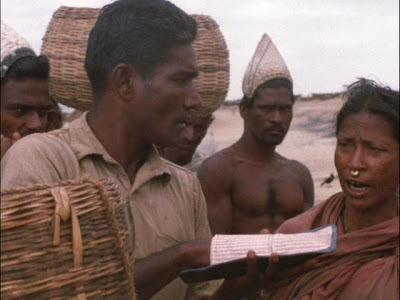 While the hippies in the previous scene had insisted that Indians only need bother to work enough to support themselves and that they are not greedy and materialistic, this scene shows the reality: the desperate effort to obtain even a minimal amount of material welfare is a never-ending struggle for many people. The English-speaking population portion is extremely difficult to specify precisely, because many people know a little English to get by “on the street”. There are varying estimates that identify the current English-speaking population today as 10-20 per cent or more.